Understand how EVM can save your company money and time and ensure project success! Earned Value Management isn't just for corporations and government contractors. It's for all kinds of organizations that have projects to plan and need to deliver those projects on time and on budget. 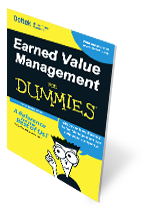 EVM for Dummies was written to introduce Earned Value Management concepts to any project professional who is considering the implementation of EVM for the first time. Whether you're a seasoned project manager, a project controls professional, or an executive, this book will give you practical advice on making your EVM journey successful which will drive more successful projects for your organization.